Libraries were the learning houses that led to Islamic golde age. Books from languages all around the world were translated in Arabic and made available in libraries that Muslims of those times were really fond of. Everywhere they went, they took their books and wisdom with them. This enabled them to access knowledge that no other nation had it in one place. It broke all language barriers and geographical restrictions to knowledge. If we wish to regain our glory, dedication to knowledge, education and libraries will play a key role. Mosque/ Community centre libraries: These libraries need to be built in all mosques and coupled with some form of lecure programs to engage our youth and deliver authentic Islamic knowledge to them. Libraries at their own, however, would not be help us achieve objectives of revivial and renasiance alone. They need to be coupled with an overhaul of educational systems and creation of leaders at national and community level. 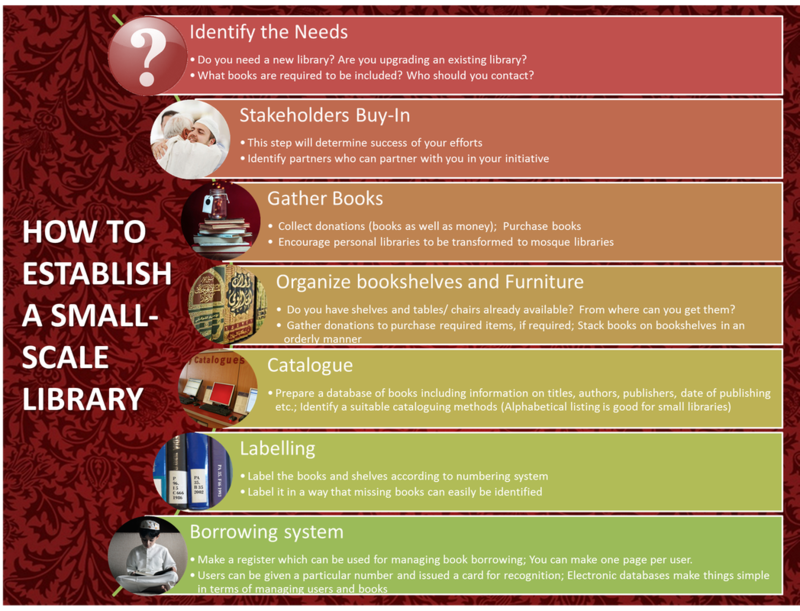 We need various levels of support to establish these different types of libraries and in whatever capacity we can contribute, we should. It is important to note that libraries no longer mean collection of books only. It can also be collection of digital objects (like our library). Most of us would be able to establish and contribute towards digital and our mosques libraries. In this bookshelf, you can find information about establishment of digital as well mosque libraries.